Funeral services for Joe Paul Evans, West Plains, Missouri, will be held at 11:00 a.m., Saturday, August 25, 2012, at the West Plains Civic Center Theater under the direction of Robertson-Drago Funeral Home. Mayor Joe Paul Evans, the son of Joe Ray and Vivian Lucy Harrison Evans, was born on November 25, 1930 at West Plains, Missouri. He entered into eternal rest on August 18, 2012 at the age of eighty-one years. His parents, wife, and one son, Gary, preceded him in death. He is survived by three children: Dr. Randall Evans, West Plains, Missouri; Dr. Susan Barger, husband, Charles, Lexington, Virginia; and The Honorable David Evans, wife, Sandy, West Plains, Missouri; six grandchildren and two great-grandchildren, Kristin Bunnell, husband, David, and their children David O. and Harper Kay; Evans Wittenberg, Aaron Evans, Anna Wittenberg, Matthew Evans, and David A. Evans; one brother: Captain Steven Evans, wife, Kathryn, West Plains, Missouri; brother-in-law Charles Stein, wife, Patty, Springfield, Missouri; sister-in-law Deana Gleghorn, husband, Robert, West Plains, Missouri; several nieces and nephews; and many good friends. Joe lived a good life. Growing up in the family home on Grace Avenue in West Plains, Joe loved, respected, and admired his parents, and brother Steve, and was loved deeply in return. His father, Joe Ray, was his son’s lifetime hero. His dad’s inner strength, integrity, and strong work ethic served as a guiding light to his son his entire life. On March 12, 1949, Joe married his high school sweetheart and the love of his life, Helen Marie Stein. Joe and Helen “secretly” eloped to Salem, Arkansas, but were surprised to learn when they returned that the entire school and their parents had already learned of their secret. Helen was the joy of his life, and her death in 2010 left a void in his heart. He looked forward to the day that he and Helen would be together again. Joe was a strong Christian, and an active lifetime member of the First United Methodist Church of West Plains, serving his church and faith in many ways including volunteering as chairman of the Board of Trustees for many years. His family is comforted in knowing that Joe and Helen are together again with their parents, son, and their Lord. Over his lifetime, Joe had many careers. He was a businessman, owning and operating men’s clothing stores (including Evans Mens and Boys Wear) for over 30 years. He also worked as a Regional Economic Development Specialist and later as Development Director for the City of West Plains and Chamber of Commerce. He worked countless hours over the years to bring to and expand many businesses in the West Plains area, including Marathon Electric, Arlee Home Fashions, DRS, and Caterpillar, and helped bring and develop the industrial park at Pomona. Joe dedicated his life to helping others. He gave over six decades of service to his community and to West Plains – the town and people he loved. 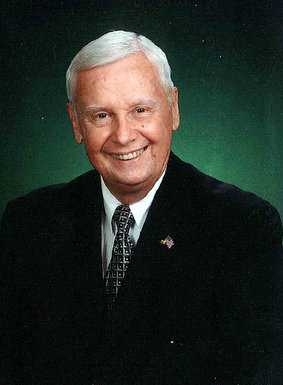 He served as Mayor for the City of West Plains from 1999 until his death. Perhaps no other mayor has been nor will be remembered as he will for heartfelt passion and commitment to the job. He and many other leaders campaigned for and supported creation of the West Plains Civic Center, expansion of parks and recreation, including Galloway Park, street and highway improvements, and was a strong supporter of the police and fire departments. He also dedicated his life to creation and growth of the Missouri State University campus, and expansion of the Ozarks Medical Center hospital. His warm smile, positive attitude, and welcoming manner made Joe special to so many people. He was always one of the first to extend a welcoming hand of friendship to visitors and new neighbors in the community. Joe also volunteered for many years in leadership roles with the West Plains Lions Club, the West Plains Rotary Club, the Abou Ben Adhem Shrine, and Chamber of Commerce. He was active in the Boy Scout and Little League programs, and served as coach and leader for generations of kids. He was active in sports, sponsoring and coaching men’s softball teams, as well as enjoying bowling – partnering in building a new bowling alley in the 1960s. Joe was most proud of his children, grandchildren, and great-grandchildren. He loved spending time with his family and was loved and respected in return. When asked by his grandson what he would do with his life if given another chance, he laughed and said, “I wouldn’t change a thing, I have lived the best life I could hope for.” Joe will be missed, but will never be forgotten. Mr. Evans will lie in state from 12:00 Noon until 9:00 p.m., Friday, August 24, 2012 at Robertson-Drago Funeral Home. Memorial contributions may be made to First United Methodist Church; to the Friends of Galloway Park or to the Boys and Girls Club both through the Community Foundation of the Ozarks, and may be left at Robertson-Drago Funeral Home. Prayers sent to all who knew him. He will be missed by many. May he rest in peace. This was a tremedous loss to the City of West Plains and to all that knew him. I have never met anyone that was as dedicated to his community as Joe Paul. He was not only a great leader, but also a great friend. My prayers go out to his family and the many friends that he made throughout the years. We will truly miss you J.P. So sorry for the loss of such a wonderful person. Prayers to the family. May Gods arms surround all of you and hold you close. Joe Paul will be greatly missed in our community. We are so saddened to hear about Mayor Evans passing. He was a great friend to our Arlee Family for many, many years. Our thoughts and prayers are with his family through this difficult time. Joe will be missed greatly. I’ve known Joe Paul since 1964 when I moved here and worked next door to him. He always had a smile and a friendly greeting. He was such an asset to our city and will be truly missed. Our prayers go to his family who are very special people. May God Bless and keep you in his care. Joe was great leader, community contributor and friend. His sacrifice of time and hard work brought growth and development to West Plains. My thoughts and prayers go out to his family and tremendous number of friends. Joe will be missed, but not forgotten! What an exceptional man Joe Paul Evans was! I am so honored to say I have worked with him! He was a great friend and mentor to me. I’ve never met anyone else who loved West Plains quite like he does. Incredible man and incredible loss. We are so sorry for the loss of our sweet Mayor. Prayers are with you all! There is a new star in heaven tonight, one I am certain shines especially bright over Joe Paul’s beloved West Plains. We have long been the beneficiaries of his great stout spirit. Bright blessings to him as he goes to his well earned rest. His community will hold him in their hearts for a long, long time. And may peace and sweet memories ease his family’s grief, that and the confidence that as he passed from the ties of this world, Helen and his Maker were there to meet him in the next. I had the honor of working for Joe Paul Evans for 10 years at Evans Mens Wear on Washington Avenue. He was a great Man to work for and had a very positive effect on my life. He will be greatly missed by many and my prayers go out to his Children, Randy, Susan and David. They can be very proud of their Father. He was truly a great person. We wish to express our condolences to Mr. Evans’ family and friends. He will be greatly missed. Prayers to family. Great leader who represented the best of West Plains. He will be missed. West Plains, our state, and our country have lost a giant. He was such a great friend to so many. He did the right thing. He believed and invested in others. He loved his community. His life is a legacy of service to others! Susan and the rest of Joe Paul’s family – Your dad was a big part of my childhood and I am so sorry for your loss. He was a great guy and i know you’ll miss him so very much. He obviously did a fantastic job of raising his family and had a right to be proud of you all. A bitter sweet congratulations to you on your marriage Susan. Take care! I have had the honor and privledge of not only assisting Mayor Evans at the office, but becoming his friend. He was a fantastic person, whom I am very fortunate to have known. He will be deeply missed, not only by me, but all those he has touched in life. To his family, I am very sorry for your loss! You will all continue to be in my thoughts and prayers. So sorry to hear pf the passing of Joe Paul Evans., a kind and caring man who was a credit to his family and his community. My heatfelt sympathy to his family and many friends. I know he will be missed greatly. Joe Paul and Helen were amoung my parents closest friends and our families were very close. Gary, Randy, Susan and David “Judge” Evans were almost brother and sister to us. I worked for Joe Paul at Evans Mens Clothing during my senior year in high school and have many memories of that time. He was a wonderful person and good boss. He was great for West Plains and we will all miss him. Susan, I am so sorry for your loss. My thoughts are with you and your family. We want to extend our deepest sympathy to the Evans family. Joe was a good man, and he will certainly be missed. Joe Paul will be missed by many. . .RIP. A life well lived, a race well run. . .
Prayers and condolences for you all . Thank you for all the years of service that you family has given and for the many years to come . David: I am so sorry for the lost of your father and our mayor of west plains. My thoughts are with the whole family and God be with you all during your time of loss. Dear Susan and siblings: my heart and prayers go out to you in the loss of your beloved dad. We met your famliy shortly after moving to W.P. in 1962 among the very first we met of many and quickly became friends . The memories of many good times will all remain. Susan, my heart especially goes out to you as I know how close you and your dad were to each other. My condolences to all of you and to Steve and Kathy – He was very proud of all of you. My condolences to the family. I feel with Joe Paul’s passing it is also the end of an era. A shame people like Joe Paul are the exception as they do so much good. Rest in peace Joe Paul. Joe Paul was truly an ambassador for the city of West Plains. He cared about his community and he was always interested in and supportive of the businesses and organizations that were a part of the community. He always had time to inquire about how things were going. During the five years that we lived in West Plains we saw and appreciated the leadership that he brought to the community. Our sympathies to the Evans family and to the West Plains community. Susan, Randy, David and Families – Sorry for your loss. There will always be only one JP. He was, like you are, a good friend. I first met Joe Paul in 1959 when he said, “You’ll love it here. West Plains is a great place to live.” Thru the years he never varied from that belief. West Plains and South Central Missouri are much the better for his hard work and dedication to the improvement of the area. His selfless determination to make West Plains more that just a spot on a map will be remembered by historians as they look back on the progressive years of the city. Thanks Joe Paul for all you did. God’s Speed. My deepest sympathy goes out to you and your family. West Plains has truly lost a very dear friend. RIP Mayor Evans.